SUPERSTAR SHAKE UP PART TWO! If you thought the shake up was over after RAW, then boy were you about to be shook like a ruddy basket of bread at a basket of bread shaking contest. It was time to find out who would be swinging for the blue team for, at least, a bit or maybe longer. But was it any good? Similar to the Monday show, Tuesday night began with two big name acquisitions making their presence known, only this time some familiar blue boys turned up to the party as well as Baron Corbin and AJ Styles came out to interrupt Kevin Owens and Sami Zayn respectively. Opening the show with Owens, the current United States Champion, welcoming us to "The New Kevin Owens Show" before cutting a pro-Canada promo got thing off on the right foot. Personally, I was surprised just how much heat Owens promo got for saying he was from Canada, speaking some French and mentioning some kind of sport, but The Prizefighter cuts a watchable prom and if the live crowd is involved it only adds to the enjoyment at home. 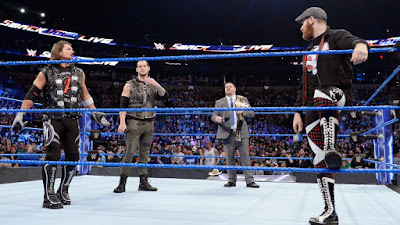 Corbin, Zayn and Styles all had short promos of their own, but nothing particularly substantial other than they wanted a shot at the US title. Owens reaction to long-time rival Zayn joining him on his new show was probably the highlight of the whole thing for me. Things concluded with Daniel Bryan awkwardly explaining that the winner of Owens v Chris Jericho on the RAW exclusive PPV, Payback, would actually be on SmackDown full-time, whilst Corbin, Zayn and Styles would fight it out in the night's main event to determine the first guy to get a shot on SmackDown. Randy Orton picked a DQ victory over Erick Rowan in brawly encounter, after Big Red twonked him with the steel steps. Bray Wyatt also appeared on the screen, despite being shook to RAW the previous evening, reminding Orton about their upcoming House of Horrors match on 30th April. An expectedly sound tag match here, that quickly broke down and finished with an superb flurry of action. Personally, I would've liked to have seen Jordan in the face in peril role for a longer time, as it seemed like as soon as The Usos had started to build a bit of heat with their cocky dickhead characters, they'd lost their man and were under attack. However, everything after the hot tag from Gable (which included a gorgeous moonsault) was great stuff, with the two teams switching momentum back and forth and the action coming quick and crisp. The quality of the work later on, such as the strong near fall as Gable got his knees up on an Uso splash, makes me wish that these two teams got more time to put together a match that could have been something special. It was a good match, but with time and with more crowd investment it could have been much better. The Shining Stars jumped Gable & Jordan post-match, with a slightly new denim based look, so perhaps they'll get more of an opportunity to showcase themselves on Tuesday nights, although considering that hadn't won on RAW since November it wouldn't take much. Mojo Rawley squashed new blue boy Jinder Mahal, after Rawley's pal American Footballer Rob Gronkowski chucked a bear at "The Man Who Comes in Peace". A segment billed as Shane McMahon explaining the State of the Women's Division was really quite odd, as he had SmackDown Women's Champion Naomi, alongside Becky Lynch, Carmella (with James Ellsworth) and Natalya stand in the ring so he could introduce new signees Charlotte Flair and Tamina. The problem was that was it, there was no brawl, no indication that anyone would be feuding with anyone else, it was just Flair coming out on the ramp, looking around and then the show moved to something else. Tye Dillinger continued to gain momentum, interrupting, a now solo, Aiden English and then pinning him in a matter of minutes. Another weird talking segment, that didn't quite come off as well as it could, but it does open up an interesting feud between Shinsuke Nakamura and Dolph Ziggler. The Show Off's promo had some nastiness behind it as he moaned about the newcomers riding on his coattails, but some of the content was a little weird. Such as claiming that next week's show won't be as exciting and the show after even less exciting and so on and so on, which seems like an odd way of getting the current viewers to keep tuning in next week. 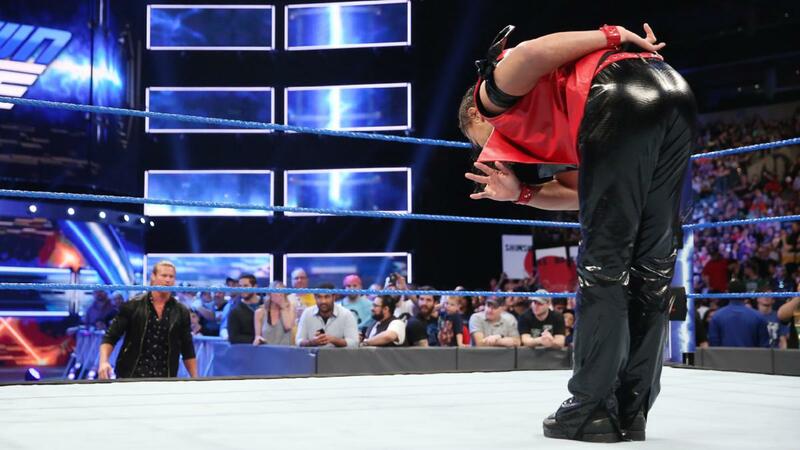 The reaction to Nakamura's interruption was probably the best thing about the whole situation as after ZigZag had claimed not to no who Nakamura was, Nakkers blocked a superkick and Ziggler looked scared. I'm not sure any of this sold a potential feud or upcoming match. These two have the potential to tear the house down, but if the writing in the build up is poor it won't get the attention it deserves. A killer main event here as the trio worked well together, used their in-ring strengths and character traits to drive a three way that had the potential to end up going any way. Corbin looked dominant, often coming out on top of two on one collisions, Styles looked like the workhorse that he is and Zayn played the battling underdog role brilliantly. The contest was at it's best when all three where interacting simultaneously or in quick succession, with a number of creative spots like Styles blocking Corbin's Big Bossman homage with a solid knee to the face from the apron and Zayn escaping from an attempted Doomsday Device variation with The Phenomenal One looking to hit a Phenomenal-er Forearm. The highlight however came in the last couple of minutes heading towards the finish and out of a couple of signature near falls, as the three exchanged running strikes in the corner and then in the centre of the ring. 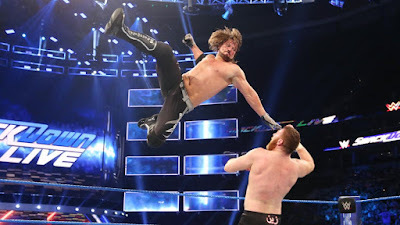 The change of gear was just what the match needed and lead wonderfully into the pendulum swinging finish, that saw Zayn knock Corbin off the apron with a Helluva Kick, only to walk straight into a match-winning Phenomenal Forearm from AJ. The only thing lacking for me was any really convincing near falls, but that's a minor complaint for a TV main event. 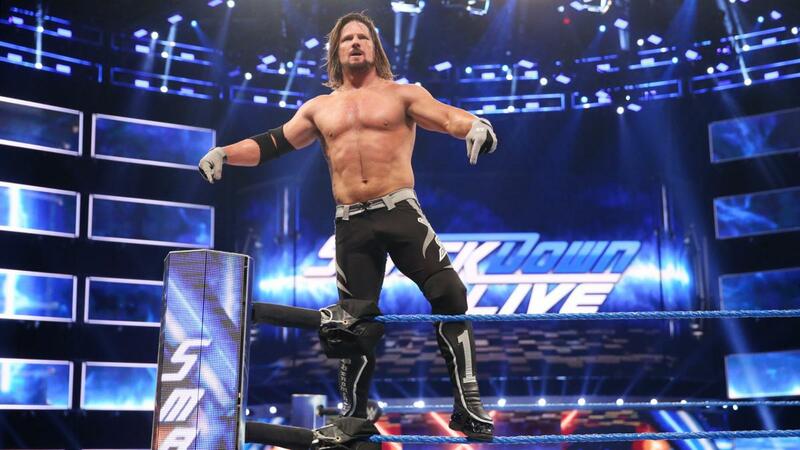 This week's SmackDown was similar to this week's RAW, with the Superstar Shake-Up gimmick being used to keep things interesting, but also featuring a number of missed opportunities and rushed matches. The main event, arguably, kept the shows rating about average and made it a better show than RAW, being the best item on either of WWE's mainstream offerings this week. I'm looking forward to seeing how the likes of Kevin Owens, Sami Zayn and Charlotte Flair fit on the brand long term, although it's hard to get excited about the likes of Jinder Mahal, Lana and The Shining Stars.